Tory from Databox: What was Interius doing regarding data analysis and client reporting before using Databox? Marcelo Gutierrez: That’s an excellent question. Before Databox, we used to build keynote presentations on a monthly or bimonthly basis. We used them to present results to our clients. We’d have to manually pull data from different sources and then cross-reference a lot of the data in order to present the results to the client. We’d also have to log in to different platforms like Facebook Ads, Google Ads, and HubSpot in order to provide an analysis on a daily basis. But, the problem is that you have scattered information from different sources and it’s not that simple to analyze what is happening as a whole in real time. Tory from Databox: Right. So you were seeing those results that happened two weeks ago but you weren’t necessarily able to act on them as you would have liked in real-time since it wasn’t that easy to actually access the data. Is that correct? MG: That’s correct. And, some of those platforms that we were pulling data from are used by different people within the team. Tory from Databox: So, Interius was building some strong reports and you were doing good work with them, but you weren’t necessarily able to use them as often as you would like since they were so time-consuming and you had to put in a lot of time to actually produce the reports and show you those great insights. MG: Exactly. At the beginning of every month, for 6-8 clients, we used to do these Keynote presentations and it was really time-consuming. It probably took a whole week of building presentations and presenting them to our clients. As we continued to grow, we knew that this was not scalable and the best way to present performance, so we started to look for ways that we could be more efficient. Tory from Databox: Right. And so then, Databox came along. 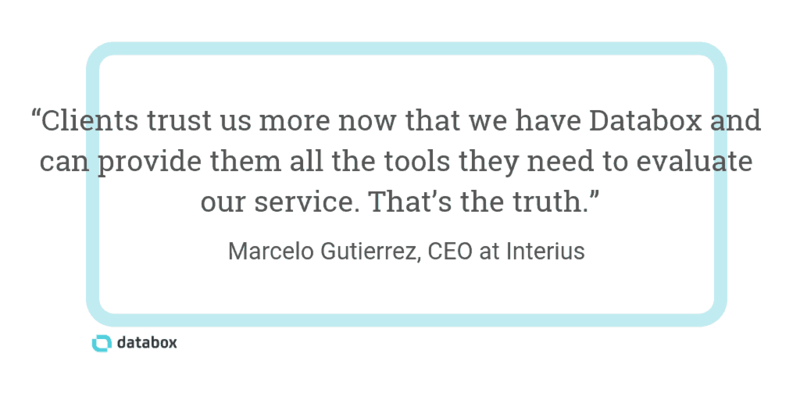 How has that changed the way that Interius is using data and reporting to clients? MG: Databox is a perfect match. I really mean it because we used to do what Databox has solved us but we did it manually. We had the information, we cross-referenced it once a month, and we saw results. Now, we see those results in real-time. Actually, 6 months ago, we decided that it’s mandatory for our clients to have Databox. We include it in our service and actually provide five or six dashboards to our clients so that they can measure our service and our results. This is not just about building good dashboards and providing better analytics, but also an important part in building trust with clients. Clients trust us more now that we have Databox and that we provide them all the tools they need to evaluate our service. That’s the truth. And the transparency that we can provide to them, the value is absolutely clear. Tory from Databox: How do you handle a bad month? If you’re being so transparent with clients, is that difficult to deal with? MG: As long as you have what happened and you’re going to do about it [the bad month] analyzed, we’ve found that you can have a down month and that’s okay. Databox has completed changed what our clients expect in our monthly meetings. Since they’re now tracking performance and results daily and weekly, we’re no longer taking up so much time just looking at and explaining metrics during our presentations. Now, it’s more like a workshop. It’s not just a monthly results meeting anymore. It has changed dramatically for the best because everyone is more efficient, everyone is on board and has a really good sense of the data and the results that we have. Tory from Databox: Do you use Databox early on in your relationships with new clients? If so, how has that helped? MG: Since we provide Databox Databoards to all of our clients, we have also come up with some really interesting diagnostic tactics at the beginning of our process with a new or potential client. We create dashboards that actually show how performance has trended over the previous months or years to benchmark their efforts before getting started. We can see seasonality. We can see which campaigns were effective. Sometimes the client ran really effective campaigns in the past but had no way of bechmarking that and as a result, ways to repeat those efforts. Tory from Databox: Are there any ways that your specific client engagements have changed because of these mandatory Databox reports? MG: Yes. Actually, there’s a specific client that we have– a business group that owns several educational institutions here in Mexico. We started with these really little projects and ran some advertising campaigns for one of their institutions. At the end of the day, the marketing team of this business group is the same. I’m really proud that they have Databoards from Databox displayed in their offices at all times so they can always view the results that they’re getting from our efforts. I feel really proud of that because it takes some work but the value is so much more by having performance data available in real-time. Tory from Databox: So far, we’ve talked about how you’ve been able to use data to quickstart the onboarding process with new clients and also to expand upon existing client relationships. Do you have any other use for Databox within your agency? MG: I love it. During the week if I’m at the gym, if I’m at home exercising–I’m also looking at my Databoards. I really love it and I try to squeeze everything I can from Databox. One additional benefit that comes to mind happens during my sales and prospecting process. I’ve seen that a lot of companies, and sometimes big companies here in Monterrey and in Mexico, still report or have marketing reports using Excel sheets or spreadsheets or some sources that are really manual. I decided to re-engage lost leads that I had using Databox as my main service and started to promote that as a service. When you start using Databox and provide them with real information, it creates additional service offerings because of the value that you can continually provide. There are so many more opportunities with Databox. Tory from Databox: I’m continuously impressed by what you and your team are doing and I love learning about the innovative ways that you guys are using data to grow bigger and better. Where can other people watching this case study go and learn more about Interius? MG: You can come to our website. You can find our services and other information there. I would be really excited if I can connect with some of you.